The third instalment of the Jimei x Arles International Photography Festival opened its doors on Saturday 25th November 2017. The heavy rain didn’t stop the swarm of medias and people from attending this rather new but nonetheless important rendez-vous of the photographic creation in dialogue between France and China. Gradually more ambitious each year on, the Jimei x Arles International Photography Festival has set up no less than thirty exhibitions, including eight directly coming from Les Rencontres d’Arles and over twenty others commissioned to established and emerging curators active in China. The festival spread across several venues, including two large-scale ones composed of the Three Shadows Xiamen Photography Art Centre (三影堂厦门艺术中心) and the Jimei Citizen Square main exhibition hall (集美新城市民广场展览馆). Attempting to take root within local environment, these sites characterised the festival’s overall goals that were “the openness to the other, the explosion of photographic genres, and the need for strong exhibition design,” explained Bérénice Angrémy, the festival director. In between one or two ladders used by the team to complete the final preparations before the public opening, we underwent an introduction of most of the exhibitions alongside first Sam Stourdzé, Rong Rong [both co-founders of the festival], and Bérénice Angremy, and then the curators of each exhibition. Below is a personal selection of three shows that particularly caught my attention. Curated by Rong Rong, the exhibition displayed a majority of large format (2 x 1,25 meters), alongside smaller formats and two astounding screens, plunging the viewers into scenic views of crab like pine trees and sea of clouds swirling around mountain peaks. “I’ve never been to Huangshan,” explained Rong Rong, “but the first time I saw Wang Wusheng’s work, I was drawn in by his imagery – his skill of portraying Huangshan in photographs. It is not easy to use photography to express a place made famous by its association with traditional landscape painting.” Mount Huang has indeed been a recurrent subject matter in Chinese pictorial tradition for centuries, and Wang’s photographs connected with this long lineage. Wang Wusheng was born in 1945 in the city of Wuhu in Anhui Province and was graduated from Anhui University’s School of Physics. He left his hometown to study in Japan in 1984 and since then he has been living between Tokyo and Shanghai. His photographs are collected in numerous public and private institutions, including the Friedrich Christian Flick Collection in Berlin and the Kunsthistorisches Museum in Vienna amongst others. Born and raised in China, Shen Chen is a curator at Three Shadows Photography Art Centre in Beijing. In Jimei festival 2017 he curated a group show that called into question the “phantom limb syndrome”. Coined in 1871 by the American neurologist Silas Weir Mitchel, this notion referred to the sensation of pain in an amputated or missing limb, also called “phantom pain”, a type of pain that is both physical and psychological. Applying the basic prototype of “Loss/Damage - Pain - Observation - Intervention”, the exhibition took “phantom pain” as a metaphor, surveying the types of different “phantom pains” and attempting to find a cure. The origin of phantom pain can be psychogenic but also an intrinsic stress response to the loss of the organs. It is easy to recognize the loss of a body part, but harder to come to a shattered personality, the loss and erasure of memories, and the damage or division to the social structures. Chen considered artists as sort of doctors, having the ability to uncover and observe different kinds of phantom pains. 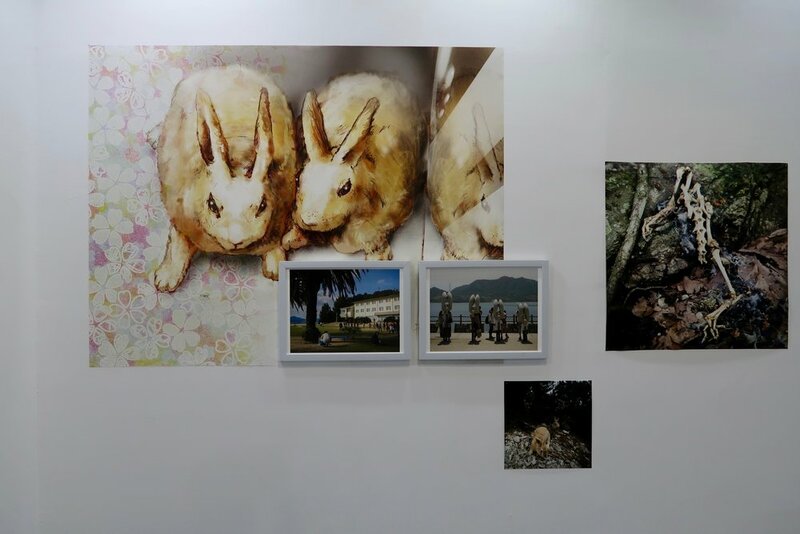 A special mention should go to the Japanese artist Yoshikatsu Fujii (born in 1979) and his body of works “Hiroshima Graph – Rabbits Abandon Their Children”. The artist put his focus on Okunoshima, Hiroshima Prefecture, also known as “Rabbit Island”, which is now a peaceful and enjoyable resort destination, but its years under the name “Poison Gas Island” during World War II rest just under the surface. The works - flashing back to ordinary island scenes, weaving in the archival images and text as poison gas production evidence - try to pass on the truth about an almost forgotten history of suffering. Tang Zehui is a Beijing-based curator and writer, the former Director of Curatorial Affairs of Red Brick Art Museum in Beijing and currently curator of 2018 First Shenzhen Biennale. In Jimei festival 2017, she introduced the female artist Yu Feifei (born in 1988 in Guangzhou), and the male artist Siu Wai Hang (born 1986 in Hong Kong). 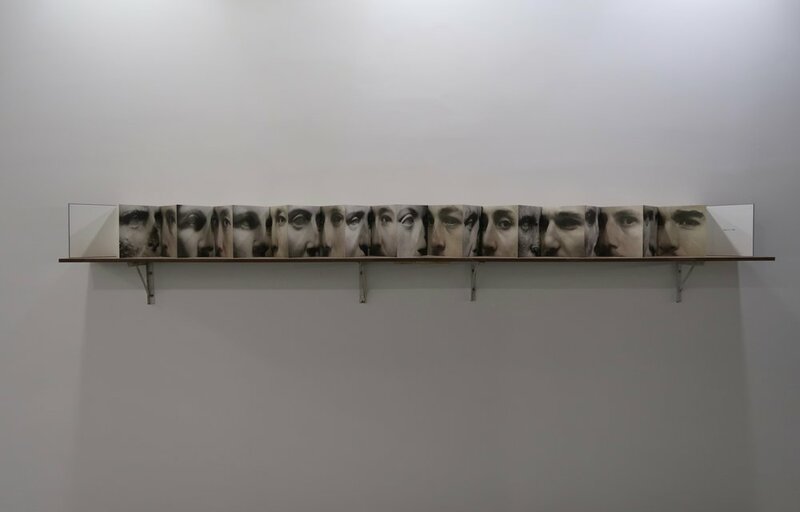 Yu Feifei's “Lovers' Eyes” used the form of folded paper, displayed on a screen, both occupying the space and dividing it. The left page of the fold showed the face of a Greek sculpture in the British Museum, the right page was the face of a modern man. The starting point of the artist's creation is the male “gaze”, but this work was precisely anti-gaze. It consisted of twenty faces, ten ancient and ten modern, on left and right zigzagging folded paper. The images cannot be captured by a static gaze, instead they presupposed a moving viewer, glancing left to right or right to left. By this wandering, reciprocating movement, the dimension of time is brought into play. Siu Wai Hang’s installations were also of particular interest. Exploring the animation book format, his work “The Elusive” placed all the photos he shot from the railing outside Hong Kong's military barracks in a specially designed machine, so that the photos were constantly turning, simulating an animation book effect. This formed a mobile, broken set of fuzzy images. The undefined and hesitative outcome was exactly what the artist wanted to convey about his visual and mental state. His other set of works used slit-scan photography to convert video into a series of Hong Kong street photographs.